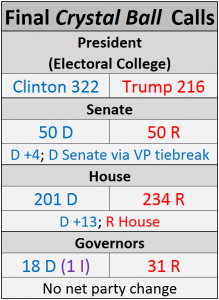 The University of Virginia’s Larry Sabato, perhaps the most accurate political analyst and forecaster in America, has issued he and his team’s final analysis and forecasts. 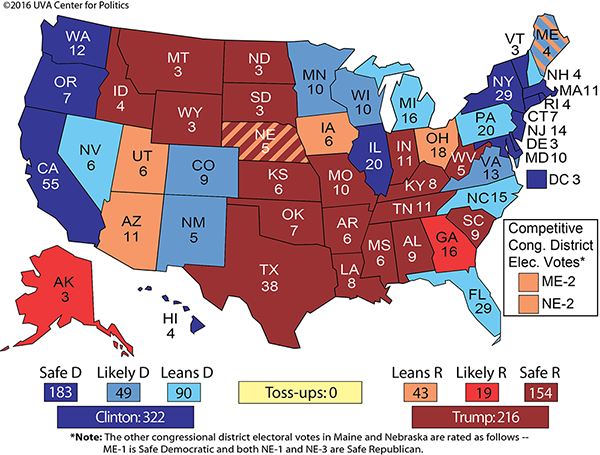 He predicts Democratic Presidential nominee Hillary Clinton will win with 322 electoral votes to Republican Presidential nominee Donald Trump’s 215 — and a 50-50 Senate tie, which means the Vice President can cast the tie-breaking, Senate-controlling vote. Sabato and his co-analysts Kyle Kondik, and Geoffrey Skelley also expect Democrats to pick up some House seats — but not enough to take away GOP control. 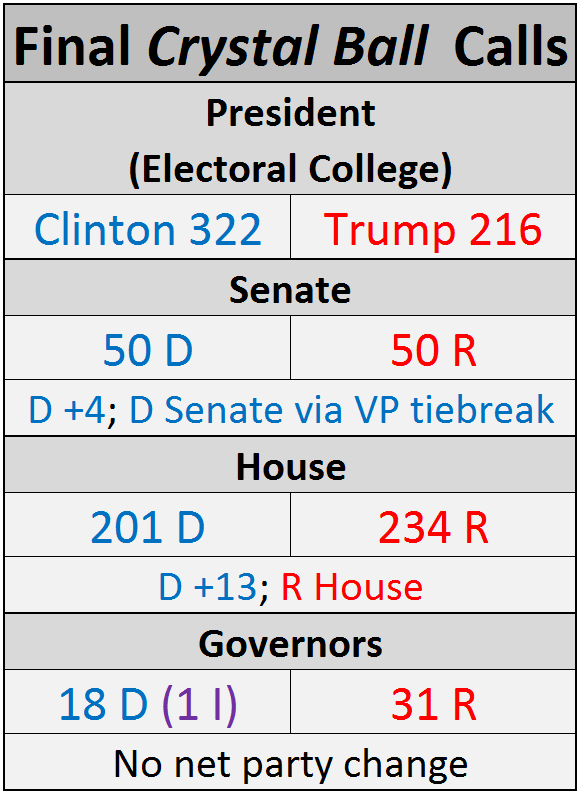 Despite some wobbles along the way, we’ve favored Hillary Clinton as the 45th president of the United States ever since we did our first handicapping of the Clinton vs. Donald Trump matchup back in late March. The edge we had for her back then has eroded a little bit at the end — we had her as high as 352 electoral votes, and in the final tally we have her down to 322, with 216 for Trump. If this is how it turns out, Trump will fare 10 electoral votes better than Mitt Romney, and Clinton will do 10 electoral votes worse than Barack Obama in 2012 — 11 or 12 if rogue Washington electors follow through on their threat to refuse to vote for Clinton (but we can’t assume that at this time). The two closest states here are North Carolina and Ohio. For a long time, it appeared that Florida was a shakier state for Clinton than the Tar Heel State, but our sources indicate that the Sunshine State looks somewhat brighter for her now, although both should be tight. Meanwhile, Ohio may be a real Toss-up state. Buckeye history and demography point to Trump, but Clinton’s ground operation could come through for her in the end. If Ohio does vote for Trump while he is losing the White House, it will be just the third time in 31 elections that Ohio will have voted for the loser. We’re picking that to happen, but if Clinton gets any benefit out of James Comey’s final (?) intervention into campaign 2016, it may be that it generates a tiny bounce that allows her to leapfrog Trump in the Buckeye State. Arizona and Iowa seem like heavier lifts for Clinton but her campaign still holds out hope in both. Ultimately, we think North Carolina and Ohio are the hardest calls in the Electoral College, so we think it makes the most sense to just split them. The buzz in the final days has been about a late Trump play in Michigan. He will likely eat into traditional Democratic margins there, but remember that Barack Obama won the state by nearly 10 points in 2012 (450,000 votes). Trump’s climb there is steep, but out of an abundance of caution we’re moving the state from Likely Democratic to Leans Democratic. We’re doing the same thing in New Hampshire, where some polls were close last week (although many operatives do not believe the state is tied), and Pennsylvania, two states (like Michigan) that have very little early voting. Clinton is focusing on these states at the end, too, and with good reason. If Trump pulls an upset, it’ll probably be because he narrowly fought off Clinton in Florida and North Carolina and managed to spring a shocker or two in the Rust Belt. Florida may tell us a lot about whether we’re going to have a long night or a short one. About two-thirds of voters will likely have cast their ballots early, so the vote count should not take that long. If Clinton wins the state by two or three points and is declared the victor early on, it’ll be hard to find a plausible path to Trump victory. If Trump captures the state, though, then we’ll have to see if her firewall states, like the aforementioned states of Michigan, New Hampshire, and Pennsylvania, as well as Colorado, Nevada, and Virginia, come through for her. In the prognostication business, what you predict at the end — when the drift of the year is usually fairly clear — is less significant than what you predict months before, at a time when the future is foggy. Starting in March, we have released a total of 17 Electoral College maps in the Clinton-Trump race. Not even on Clinton’s worst campaign days did we ever have her below 270 electoral votes. The Senate?We’re forecasting Democrats to win control of the Senate, but only by the slimmest of margins. Overall, we’re picking a net gain of four for Democrats in the Senate, which results in a 50-50 tie in Congress’ upper chamber. If we’re right about the presidential contest, that means Vice President Tim Kaine (D) will be breaking ties after Inauguration. Gov. Terry McAuliffe (D-VA) would appoint Kaine’s replacement in the Senate (long-serving Rep. Bobby Scott, an African American, is the likeliest choice). If there is an evenly divided Senate, the next important date will be Nov. 7, 2017, when the Old Dominion will hold a special election for the remainder of Kaine’s term in office (that seat also will be up for regular election in 2018). There’s also the potential for a party change that alters the Senate’s leadership if it is indeed 50-50. The most likely gain for Democrats will be in Illinois, where we expect Rep. Tammy Duckworth (D, IL-8) to defeat Sen. Mark Kirk (R). The incumbent was always going to have a difficult time winning in a presidential year in a safely Democratic state. Although his path appears more difficult now than it did for much of the cycle, ex-Sen. Russ Feingold (D) is our pick to win in Wisconsin over the man who defeated him in 2010, incumbent Sen. Ron Johnson (R). Should Feingold win, he will become the first former senator to win back his old seat against the candidate who beat him since Sen. Peter Gerry (D-RI) in 1934. In Pennsylvania, we project Katie McGinty (D) to defeat Sen. Pat Toomey (R) in a hard-fought race. Toomey strategically tacked to the middle on some issues while in the Senate, notably gun control, but his Democratic opponent has led most polls since mid-October, giving McGinty a small but discernible edge. Perhaps our toughest call where we are picking a Democrat is the New Hampshire contest between Sen. Kelly Ayotte (R) and Gov. Maggie Hassan (D). Ayotte should run ahead of Trump, but we think it won’t be quite enough in the end for her to hold on. Count this as one of the races we are least certain about. As for the seats that we expect the parties to retain, the most competitive ones are in Florida, Indiana, Missouri, Nevada, and North Carolina. In Nevada, state expert Jon Ralston writes that the early voting edge for Democrats suggests that the party has an advantage up and down the ticket. If this is right, the day after Election Day will be yet another bad one for many firms that polled Nevada and showed good numbers for Republicans. In light of what we see in the Silver State, we are going with former Nevada Attorney General Catherine Cortez Masto (D) over Rep. Joe Heck (R, NV-3) in the only endangered Democratic-held seat. We see Republicans retaining the other competitive seats. In Florida, we project Sen. Marco Rubio’s (R) 2015-2016 political journey to end in reelection after running for president and not intending — at least publicly — to run for Senate again if he failed in his White House bid. As we have discussed many times, Rubio doesn’t appear to have suffered much collateral damage among Latino voters in the Sunshine State because of Trump, running well ahead of his party mate among that demographic. Should Rubio defeat Rep. Patrick Murphy (D, FL-18) by only a narrow margin, there will be recriminations in Democratic circles for failing to go hard after Rubio, especially because he still has presidential ambitions that could reignite circa 2019.